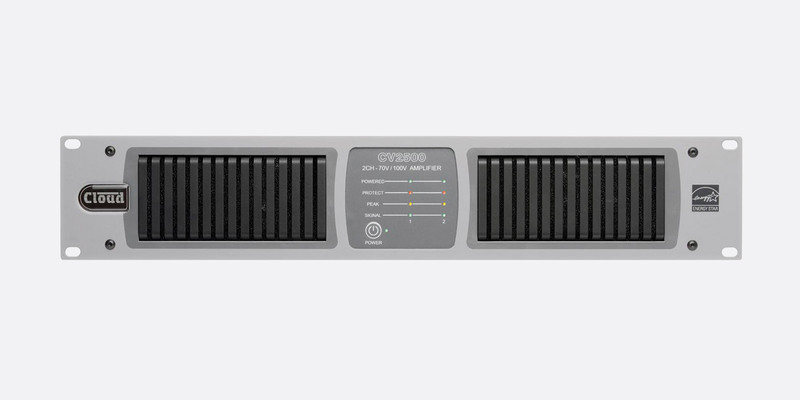 Cloud 70V or 100V line amplifiers have been designed for sound reinforcement application within retail, leisure, commercial, hospitality or industrial sectors, giving the user access to multiple channels of amplification within a single 19-inch rackmount unit. 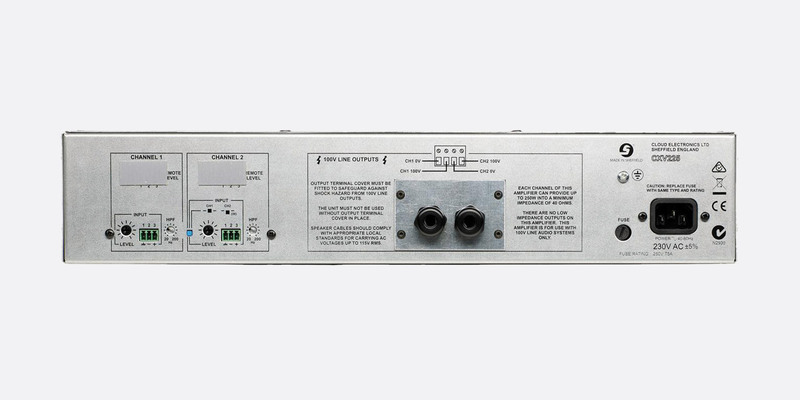 This Class-D, 70/100V line amplifier has two channels, each with an output of 500W. It has been designed so that an engineer can set the primary configuration settings, such as input routing via DIP switches located on the rear facing panel. It has also been designed with options to allow the user to control remotely via RS-232 or with a computer via Ethernet. This includes the user-configurable DSP settings such as 5-band parametric EQ, routing, delay - a total delay of 1428ms can be applied across the output channels; 65Hz high-pass filtering, delay, and limiting for all channels. Output DC detection, over-current protection and thermal monitoring are incorporated for safety, whilst an automatic power-down (APD) function switches the amplifier into standby mode, consuming around 2.5W if no input signal has been detected for 30 minutes. The user can also use an external contact closure switch to put the amplifier into standby mode. ‘Wake-up’ time is typically 200ms. The front facing panel houses slot air vents for the internal cooling system, along with channel specific LEDs to signify signal present (green), that illuminates when the output level is 30dB below the rated output power; peak (yellow), protect (red), and ‘powered’ (green) that is illuminated when the associated channel is active and hasn’t been powered down via APD. A ‘soft’ power switch is located in the centre section of the front panel, with an LED to indicate when on. 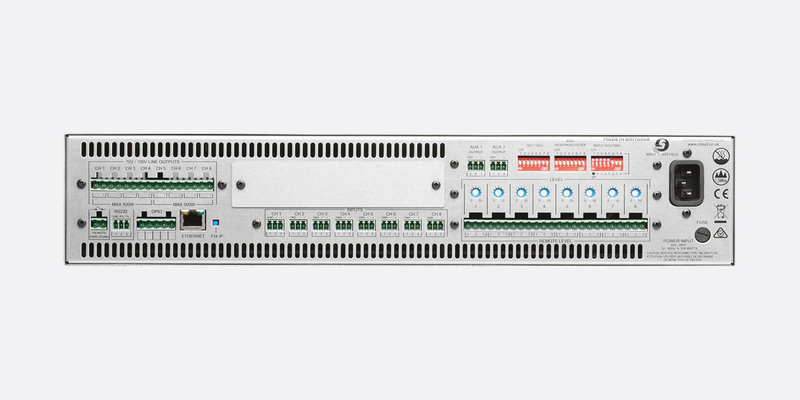 The rear facing panel has all I/O connectivity including 85-264V IEC AC power input. Electronically balanced input is via 3-pole 3.5mm-pitch, removable screw-type connection, with similar connections for RS232 connection and auxiliary outputs. GPIO, remote level, remote power down, and 70/100V line outputs are via 5mm-pitch plug in screw-type connection. There is a rotary control to set the remote level from 0-10. Ethernet connectivity is via RJ45 connection with yellow and green LED to indicate data transportation. Dip switches allows the on/off switching of 70/100V, 65Hz high pass filter, and input channel routing. Maximum output power: 1kW, all channels driven. Output voltage: 70V or 100V. Frequency response: 20Hz – 20kHz, +/-0.5dB. Distortion: 0.03% THD, at 1kHz, 1dB below rated output. Crosstalk: Less than -90dB at 1kHz, -82dB at 10kHz, adjacent channels; less than -107dB at 1kHz, -93dB at 10kHz, non-adjacent channels. Input sensitivity: 0dBu, 0.775Vrms. Power input: 85-264V AC, 40-60Hz. Mains protection: 3T 250V fuse, 20 x 5mm, rating T8A. Dimensions: 482.6 x 88 x 381.8mm (WxHxD). Weight: 6.86kg. The CV4250 has four channels capable of driving a maximum of 250W per channel, and weighs 7.26kg. All other functional properties and audio specifications are the same as the CV2500. The CV8125 has eight channels capable of driving a maximum of 125W per channel, and weighs 8.05kg. All other functional properties and audio specifications are the same as the CV2500. 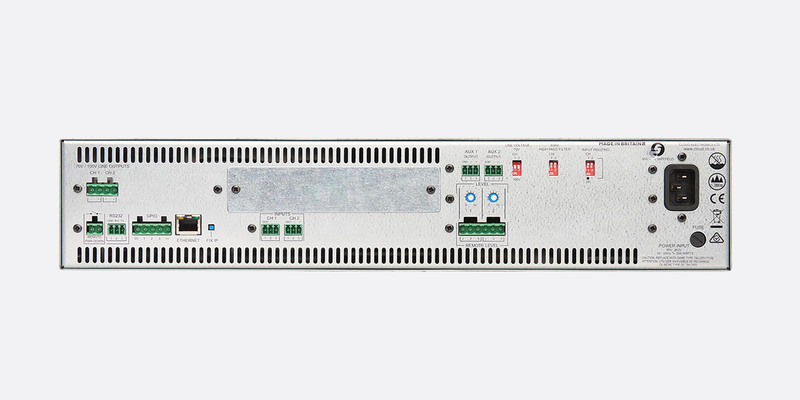 This 2-channel amplifier has been designed to offer 250W into 40ohms per channel into a 100V line system. The ‘transformer-less topology’ used in the design process has reduced the size and weight of the amplifier, along with other associated issues such as limited frequency response. The amplifier has DC, short-circuit, and thermal protection at the output stage whilst a forced-air, thermostatically-controlled fan controls the operating temperature. An adjustable 20Hz-200Hz high pass filter for each channel gives the engineer the option to limit the low frequencies entering the speaker system. The front facing panel of the amplifier has vents for air intake, a latching rocker-style power switch, and LEDs to indicate signal present (green), peak (yellow), and protection mode (red) for each channel. A green LED illuminates when the amplifier is powered on. 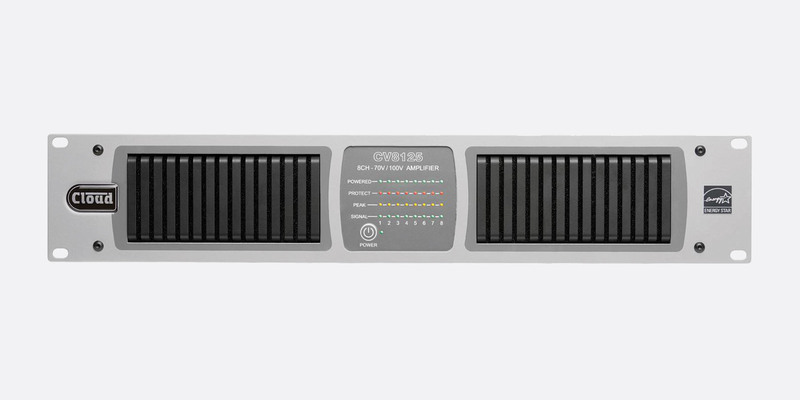 The rear facing panel houses all I/O connectivity and user control including high-pass filter adjustment, and channel input level adjustment. The electronically balanced inputs are by way of 3-pin, 3.5mm-pitch plug-in screw terminal. The outputs are by way of 2-pin, 5mm-pitch plug-in screw terminals. 230V AC power input is via IEC connection. Output power: 100Vrms, 250W into 40ohm (min) load, per channel. Frequency response: 20Hz – 20kHz, +/-0.6dB. Distortion: 0.04% THD, at 1kHz, 1dB below limiting. Crosstalk: -80dB at 10kHz. Input sensitivity: 0dBu, 0.775Vrms. Input impedance: 10kohm, balanced; 5kohm, unbalanced. Power input: 230V AC. Mains protection: T5A 250V fuse, 20 x 5mm. Dimensions: 482.6 x 88 x 300mm (WxHxD). Weight: 8.8kg. 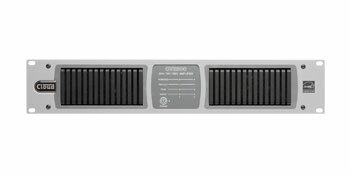 This amplifier has the same principles as the CXV225, however has four channels, each capable of driving 250W, and is housed within a 19-inch rackmount 3U chassis. The two thermostatically-cooled fans are mounted within the rear facing panel. Dimensions: 482.6 x 132.5 x 332mm (WxHxD). Weight: 21kg.